A common theme in the lost city adventure is the resilience of the explorer. Adventurers will return time and again to continue searching, even if earlier attempts prove disastrous. The iconic Colonel Percy Fawcett endured the worst the jungles had to offer only to repeat the task many times over (see post on Percy Fawcett). Half a century earlier, a duo named Catherwood and Stephens experienced similar trials. Even with disease, insects and hardship ravaging their bodies, nothing would keep them from investigating. In the 18th century, there were tales of immense cities lying in ruin and hidden deep in the Yucatan jungle but as Spanish colonists were focused on economic profit, few details were available to outsiders and antiquarians. That was until travelers John Lloyd Stephens and Frederick Catherwood decided to explore the mystery. A fascinating book “Jungle of Stone” (Harper-Collins Publishers, 2016) by journalist William Carlsen, chronicles their journey and gives historical perspective. The jungles Catherwood and Stephens combed through were a dangerous place – not only due to disease and poisonous snakes. The two adventurers found themselves in the middle of ongoing political conflict. But the thrill of discovery was too much to keep the men away. Catherwood would end up making hundreds of drawings – images of ruins and Mayan writing still used by archaeologists today. Stephens written accounts of their adventures became bestseller books, still in print today! Both Catherwood and Stephens had profited through earlier travels. After creating realistic drawings of Jerusalem, Catherwood built a panorama of the holy city and charged to view the display. Stephens had written about his earlier jaunts in “Incidents of Travel in Egypt, Arabia Petraea and the Holy Land” and the 2 volume book became a runaway bestseller – an unprecendented achievement for an American author. Both had seen seen marvels such as the Roman Coliseum and the Giza pyramids but what they found in the Central American jungle was truly unexpected. After journeying over two thousand miles from New York and slogging through the wet and mud of the Yucatan, Catherwood and Stephens looked upon an incredibly massive stone wall at Copan. “The enormity of the wall in front of them took their breath away” (Ibid, page 59). Carlsen explains it rose over a hundred feet! Upon closer inspection, the two men were amazed further to find the wall constructed of well-cut stone. Copan would turn out to be a large city complete with altars, amphitheaters, pyramids and palaces. 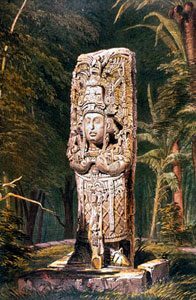 Catherwood and Stephens would find giant monuments and intricate skillfully-carved stela. Like the Egyptian pyramids from Giza to Memphis, the archaeological site at Copan is considered a UNESCO world heritage center today. To see ruins in the America’s that were equal in craft, size and scope to those of ancient Egypt or Rome was astounding to men of Catherwood and Stephens time. It was not long before Stephens realized that these places were not built by foreigners or an advanced Atlantean race but by the native Mayan people of the Yucatan. They would go on to “find”, describe and draw several other Mayan cities such as Palenque, Tulum and Mayapan. Illness, exteme heat and discomfort would dog their every step. Nevertheless, the two men would introduce these incredible and seemingly improbable ruins to the world. During the 1800’s the colonial elite experienced much trouble when old power structures collapsed and locals took up arms. The peninsula’s Mayan Indians had suffered centuries of cruel subjugation by the Spanish. After Mexico gained independence the ways of the colonial ruler came to an end and political turmoil took its place. The Yucatan city of Valladoid would become the center of machete massacres as the natives rid themselves of former overlords. The ruins Catherwood and Stephens found also represent the demise of an elite. These impressive structures were built by Mayan kings and their descendants as a symbol of order and power but all of this was eventually abandoned. I wonder if Catherwood and Stephens ever considered that the modern world of America and Britain could also come crashing down. Dynasties and power structures can endure for some time but not forever! The British Empire transitioned into a benign commonwealth and the 21st century US has found a powerful adversary in China but it is more frightening to consider that all of Western civilization could end up lost and in ruin! Catherwood and Stephens would return to the Yucatan to experience more hardships and create a second book. Further adventures are chronicled by Carlsen. 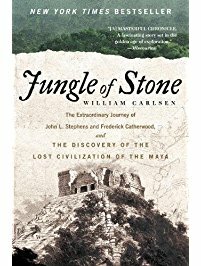 William Carlsen’s Jungle of Stone is one of the more readable non-fiction adventure stories I have come across. I recommend this book to those who feel bored and trapped in a safe, repetitive daily existence. You may or may not want to endure the trials of the jungle but it might just light a spark in your heart. You might find yourself reaching for more! Fascinating. Who knows what mysteries surround us.